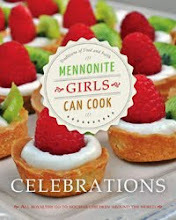 Ten years ago on June 7th, 2008 I posted Zwieback to begin the Mennonite Girls Can Cook blog. Today's recipe is a bit different from my first, different from the one published in our original cookbook as well as the one published in Bread for the Journey. Anneliese and I were discussing our Zwieback recipes and agreed that what our mothers had in the kitchen is what they used to make their Zwieback. So, if some weeks they had more butter or milk or flour than other weeks, that would have been what that week's Zwieback would have included. The best thing about Zwieback continues to be that they are best when shared with friends and family around a table. This blog has been a place of sharing with all of you who have joined us around this table, graciously encouraging us as we have shared our family favorites and as we have together learned new ways of doing things. We have wondered for some time now how long we should continue to post new recipes. 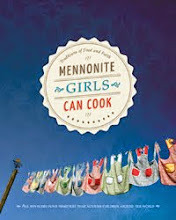 We will always remain the Mennonite Girls Can Cook but everything this side of eternity has a beginning and an end. We have over 3000 recipes on this blog and have decided that we will consider the recipe blog complete. Today is our last regular new recipe post. On Sunday, Judy will be sharing our final Bread for the Journey and on Monday we will have a look back at the past ten years. Rest assured, you will continue to have access to this recipe blog and all the recipes we have shared. You may notice that work will be continuing as we strive to make the blog as easy to navigate as possible. We will be highlighting our recipes to compliment the changing seasons. We would love to have you join us on Monday as we celebrate what God has done and thank Him for what he will continue to do. In the meantime, stay calm, bake Zwieback and call a friend over to share them. Heat the milk until it is just warm, room temperature is perfect. In the bowl of a bread mixer, or in a large bowl, cut the butter into 3 cups of flour with a pastry blender. Add the milk mixture, sugar, and the salt and yeast mixture to the flour and butter. Continue to add flour and allow the machine to knead until smooth. If you are mixing by hand, turn the dough onto a floured counter once stirring becomes too difficult. Put the dough into a large bowl and cover with a tea towel or a lid. Let the dough double in bulk, about an hour. Line 3 large cookie sheets parchment paper or grease them. Take a piece of dough the size of a large orange, hold it in the hand it feels most comfortable. With your other hand, squeeze a bit of dough between your thumb and forefinger about the size of a walnut, pinch your thumb and forefinger together to squeeze it off. Take the dough and place it on the pan. Again, squeeze the dough between your thumb and forefinger, this time a smaller piece to make the top bun. Squeeze it off and place it on top of your first bun. Press down through the top and bottom buns to seal them together. Repeat with all the dough. Cover the buns with a clean tea towel and let rise until they have doubled. Start to preheat the oven after 25 minutes so it is ready to bake. Bake in a preheated 400 F oven for about 20 minutes. If you have a convection oven, bake at 375 F for about 15 minutes or until golden brown. I will miss seeing new recipes every day. Yours is the first website I visit every morning. I would like to say thank you for all your recipes and beautiful words of worship and inspiration over the years. God's blessings to all of you! Thank you so much Janina for those kind words! God bless you too! You have been an inspiration (and a culinary one too!). Oh such a delight to hear from you Kay! Thank you again! We feel honored that we have been part of your morning routine! Thank you for joining us on this journey. How I have loved coming to this site almost everyday since I first discovered you! Thank you so much for the recipes, fellowship, faith inspiration and sharing you have provided. I cook a lot and have found some of my favorite recipes here that I have made time and time again. May the good Lord continue to bless your group and all of your followers. Dear Jill, thank you for such kind words. We will miss it too but hope that we can make the blog even more recipe search friendly in the days to come. I shall miss this daily read very much! You have inspired me time and time again on so many levels. Many of your delicious recipes have become new traditions over here and most importantly I have learned how to be a good person and good grandmother from your examples. So thankful for each and every one of you and wish you all God's richest blessings. Your friend always .... my eyes are leaking and will try to stay calm ... Love you all, Rosella. Dear Rosella! How will we manage without your daily words of encouragement? You are the dearest friend of MGCC and we love you and are so thankful for the gift you have been given and have blessed us with! ... you know how to find us... always. I really love this blog. I check it every day and have used many of your recipes. I will miss it very much. All of you have been an inspiration to me. Thank you for being part of our journey. We are so thankful that we have been part of your daily routine! This is the first spot I check each day for a new recipe. I will so miss it. I have many recipes that I had never even heard of that you girls introduced to this Texas girl. Thank you and God bless. Brenda, thank you for making us part of your daily routine! We love knowing that we have been able to share our heritage recipes just as we love other ethnic recipes that we have learned to make. I will miss this so much! I check it first thing everyday when I get to work! I have loved getting to know you from your blogs. The recipes here are the best! I use so many now in my meal rotation! Thank you for all that you have done! Dear Lisa, We thank you for following us and for caring about our lives and our recipes. Those of us that are blogging will continue and you can find us there! Your recipes inspire me and they are truly wonderful. I have your books and get rave reviews on the Berry Scones and Peppermint Cookies whenever I make them. Thanks for taking the time to share with us a look into your journey of baking and friendship. I’m always searching for recipes but know if I want a tried and true recipe I always go back to your website. Thanks ladies! Sherry, thank you for sharing your story with us. We love hearing success stories from the recipe books and the blog. We have loved sharing and your kind words are icing on the cake. This is such sad news. I look so forward to new and inspiring recipes! Dear MrsDuncanMahogany, I know you didn't mean to make me smile but somehow I am smiling. It is sad in a way but there are so many recipes that we think will feel new to everyone when they are rotated through in the years to come. Thank you so much for your recipes and inspiration over the years. I truly will miss reading my daily email every morning from you beautiful ladies. All the recipes I have tried have been amazing! You ladies are a blessing to so many. Thanks again! Kathie, thankyou for sharing with us that we have been part of your daily routine. We feel so blessed that we had the opportunity. I have really enjoyed finding new recipes that are tried and true. Our family has their favorites from your blog. I will definitely miss the new posts, but can surely understand. I wish you the best in whatever you do next. Elle, thank you for sharing with us today. I am so glad that your family has enjoyed our recipes and we hope they will continue to find new ones from our archives that they will enjoy as well. Thank you for the recipes and inspiration. I will miss reading this blog every day. But I wish you all the best in the future. Diana, thank you for being part of our journey and for making us part of your daily read. Thank you for telling us how we were able to bless your family. We hope you will continue to enjoy new recipes that you haven't yet tried. Thank you for your posts. I read them almost every day and will miss them. Mrs D Thiessen, thank you for reaching out today and for your kind words. Thank you for being part of our daily postings. Thank you so much for all that you have shared with your readers. Yes, I am among those that go to your blog first thing every morning. I grew up in the Fraser Valley but moved away over 40 years ago, and loved reading about spots in your individual blogs, (making reference to Funks Supermarket as one example). It all warmed my heart and brought back many childhood memories, to say nothing about how I so enjoyed all of your lovely recipes, pictures and devotionals. All the best in your future endeavours! Thank you for sharing your story. There really is no place like the place you grew up. We are thankful that we were in some way bring back fond memories for you. What a remarkable run! Thanks to each one for your labor of love. I know that I will be dipping in and out as I always have done. Many blessings! OH Vee! All I can say is that it is us that thank you! So glad you will still find us where we blog our lives. Hugs! Congratulations! And, Well done, good and faithful servants! You have been diligent, creative, inspiring, gracious and caring the whole time - such an encouragement to invite relationship back into the homes of so many! I'm sure the blog will continue to be a bit hit for many as they search for 'just the right recipe'! I know, I will continue to visit! Wow !! !I soo loved going to your blog and trying sooo many of your recipes ! !I definitely will miss it!! !Most recipes I made were such a hit for our family ! !and soo loved seeing recipes from family from way back !! !Thank you all for sharing of your time !! !NOW it's time for me to get ALL the recipe books you gals have published ! !Thanks again and Journey On !! Thank you Auntie Esther! We share so many of our favourite recipes and I'm always so thrilled to see how Kama carries on family traditions too! Thank you so much for the time and effort of your blogging. I will miss seeing the new recipes daily. I love checking in to see all the fun things that you do in the kitchen. Grusendorf Family, thank you for your kind words today. We are so thankful that we have been able to be part of your day. I too will miss reading this wonderful cooking blog. Thank you for leaving it up for us to check when we need a little culinary motivation. Best wishes, Jenny from New Zealand. Dear Jenny all the way from New Zeland... what a joy to know we are connecting all across the globe. Thank you for your kind words! Thank you for the time and talents you have all shared with us for these past ten years. What a joy it has been to visit each morning with a cup of coffee in hand. The day's dinner was often planned from inspiration received during that visit. I must say that the recipes I have tried have become family favorites. Many others are on the "try someday" list so I am happy to hear that the blog will remain accessible. All the best to each of you. You have left comments that have encouraged us through the years. Thank you for doing that! It's so wonderful to know that our recipes are now your recipes too. Dear Angharad, Thank you for being part of our readership over the last ten years. You have been an encouragement to us through the years and for that we thank you! I have so enjoyed all the recipes and the way you have all encouraged me! Yours is one of the first places I go to when I need inspiration for a new dish or help with dinner ideas. Thankyou for all the time and love you have put into this blog, and God bless you in your "retirement"?!! Dear Judy! That is just so sweet of you to thank us today! A friend who encourages is worth gold. Thank you dear friend! Your blog is the first thing I check every morning. I will truly miss it. Thanks for leaving the recipes up as I refer to them often. Thank you and God bless you all. Thank you for your daily visits and kind words. I suspected you might be winding down, and now my suspicions are correct. Ever since discovering you I've relied on your daily blog for encouragement, recipes, and a touch of normalcy in a frenzied world. Your blog is often the last thing I check each day, as an antidote to the confusion of today's culture. Thank you for being a faithful friend...always there, always with a word of good cheer, always true. Thank you for those caring and touching words. We will still be posting on our personal blogs and we hope you will visit us there. I have enjoyed your blog so much - I've tried many of your recipes and I am so relieved to hear we will continue to have access to all your wonderful recipes! Many of them have become tried and true favourites and your blog and your cookbooks are one of the first sources I choose when looking for a recipe using a particular ingredient! You have given so much more than just recipes - your devotionals as well as your 'background stories' for many of the recipes have been a source of encouragement and blessing! I wish each one of you God's continued blessings and joy as you continue on in your journeys! Dear Esther, thank you for those thoughtful words of encouragement to us. It has been such a pleasure and we are thankful we can continue to share the recipes. My heart skipped a beat as I read that you all will be winding down your blog. I have so enjoyed everything about your posts especially Bread for the Journey. Thank you for your generosity and blessings to each of you going forward. We appreciate your sentiments and it is so wonderful to have had the opportunity to share our faith in this forum. 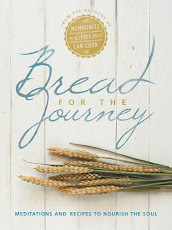 Our bread for the journey book is a wonderful selection of devotionals and our stories. I will miss seeing your new recipes each day as I, too, am another reader who once I discovered your blog would visit multiple times in a week for your recipes! This has been an inspirational website, as well as, a great source for wonderful recipes! I have printed out many of your devotionals & always looked forward to reading "Bread for the Journey." Thank you for lovingly sharing your faith and thoughts on this site. They have often brought encouragement to me during trying times... I am saddened & will miss the posts and the latest recipes from your group. With deepest thanks for your time & efforts to have maintained this blog for so long and allowed each of us to share a glimpse of your lives along that journey. Plus, enjoy such yummy recipes that you have given us along the way! You will be missed! May God's Blessings continue to follow you! I will miss your daily blogs and inspirational recipes that challenged me to bake and cook differently. Thank you.